My goal was 2000 pages so I finished at 62 percent...not too bad! 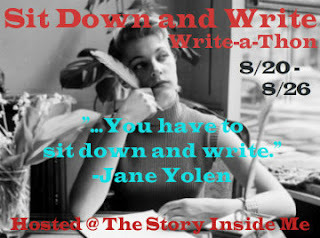 Don't forget about my Sit Down and Write Write-a-Thon coming next week! Details HERE or click the button. Great job! I wanted to read more but only read 3 books. It's all good as long as you had fun! You seemed to gotten a lot of pages read, at least. :D Progress! Michelle, you did awesome! Hope you enjoyed the books that you read! I stalled in the second week of the Olympic Readathon. I'm stuck on a book that I'm not enjoying very much but determined to finish. Hope I can finish it during this week's RAT! You read so much! I've been wanting to read Cider House Rules for a while.